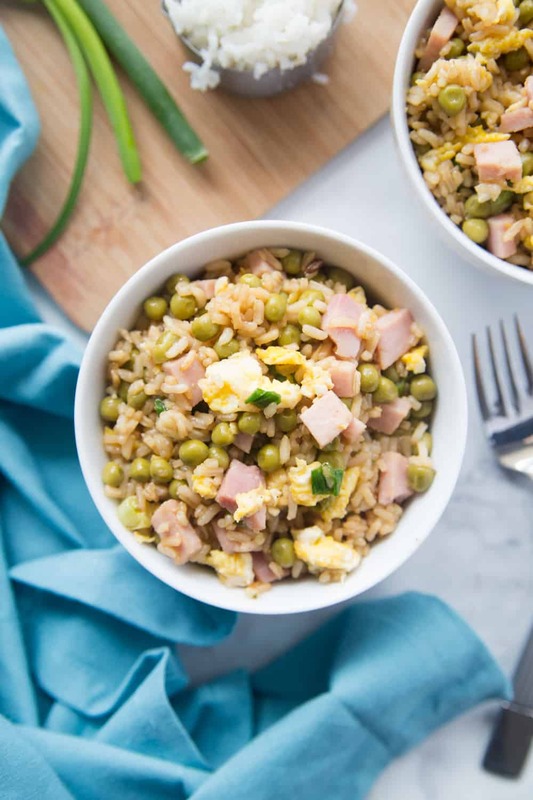 This homemade fried rice is even better than the restaurant version! Homemade fried rice is a crowd pleaser! 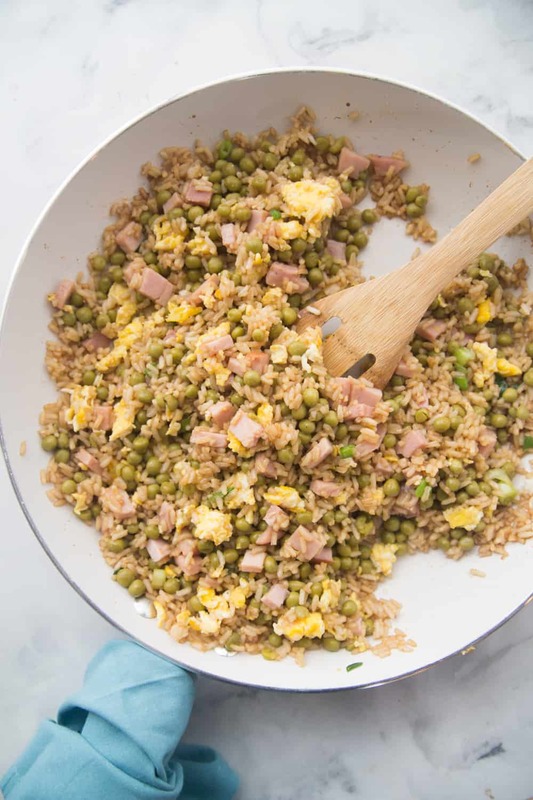 Your whole family will love this easy fried rice recipe! 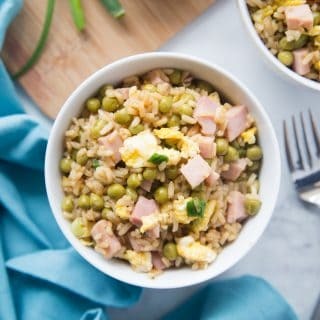 My husband doesn’t even like rice, but he requests my homemade ham fried rice all the time. 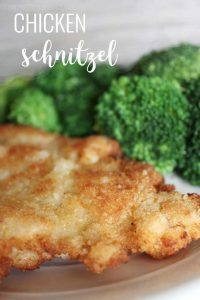 It is such a yummy and unique weeknight meal. We typically eat the rice for the main course, but for special occasions I make it as a side to Catalina chicken and cook up some pot stickers. 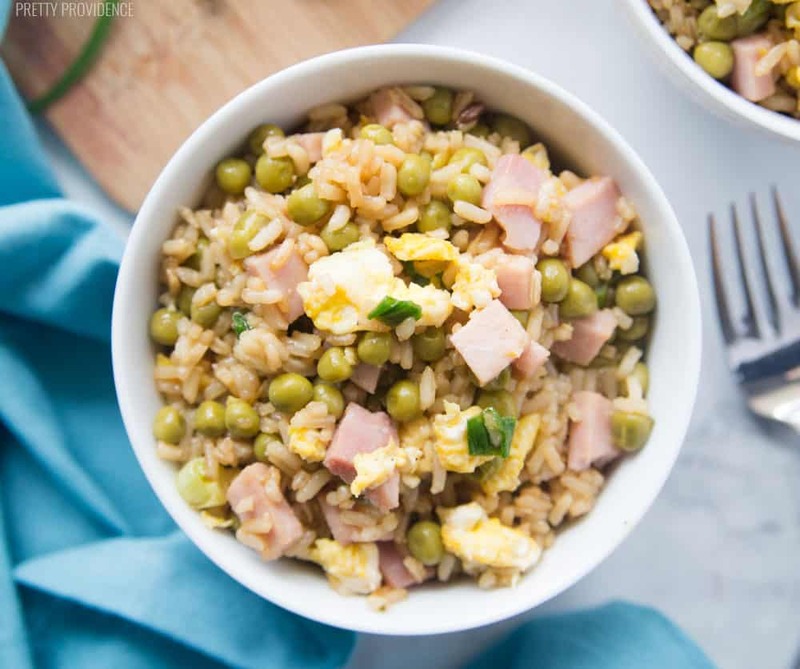 Either way you serve it, you won’t be disappointed with this easy fried rice recipe! How do you make fried rice with egg? The greatest thing about this recipe is that it can be made all in one pan!! Can I get a hallelujah for less dishes?! I just scramble my eggs then set them aside until its time to add them back in! Can you make fried rice with leftover rice? Yes! Homemade fried rice works great if the rice is cold to start, so its a great meal to make with leftover rice! It still reheats amazing, too! If you have leftover fried rice after making this, our homemade rice pudding is also amazing! What type of rice works best for fried rice? Any type of rice works fine, but we have found that we prefer medium or long grain rice in our house! Jasmine or basmati rice are our favorites because they will not mush or stick together like sushi rice or some other really starchy varieties of rice will. 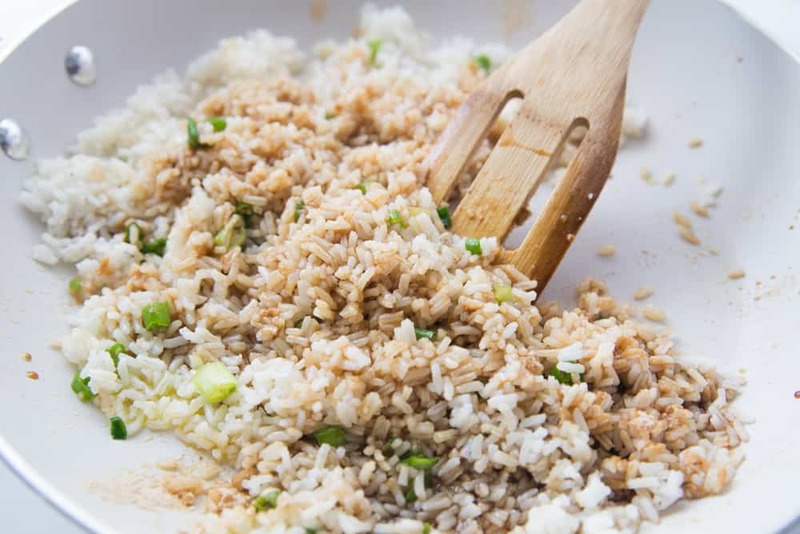 You ready for this easy fried rice recipe?! 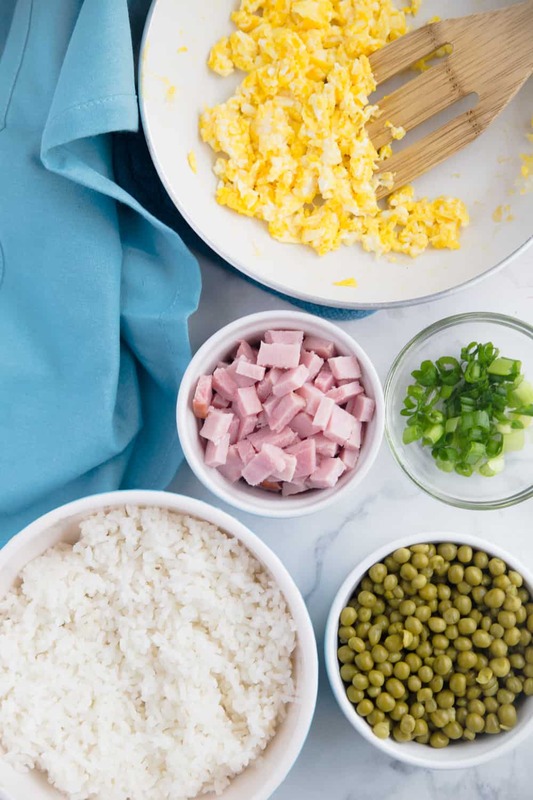 Homemade fried rice is definitely one of our families very favorite meals! Even the pickiest of eaters will love this restaurant copycat! 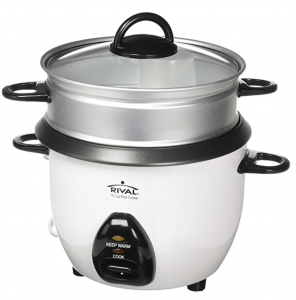 If you aren't using leftover rice, start your rice cooking. While rice is cooking, chop meat and onions into small pieces. Scramble eggs and scoop off onto a plate. I use frozen peas, so I thaw them under some cool water at this point as well. 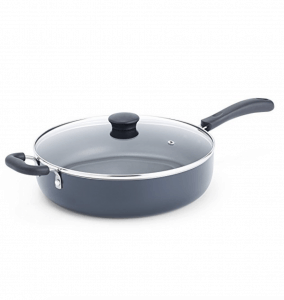 When rice is prepared, heat oil, garlic and onions in your pan. Add rice. Gradually add in fried rice packet and soy sauce. Once well mixed add all remaining ingredients and salt and pepper to taste. Enjoy! The yield is about 8-9 cups, so if you are serving as a side you may want to cut the recipe in half, depending on how many you are serving! 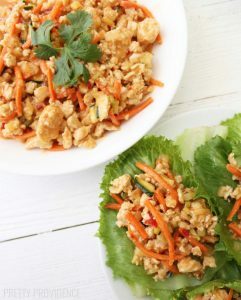 Such a great way to use up leftover rice! I adore fried rice! I love finding new ways to make it and this is one of our favorites! Oh, I could eat fried rice everyday!! 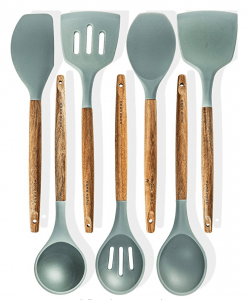 Love it & love how easy & quick it is to make! 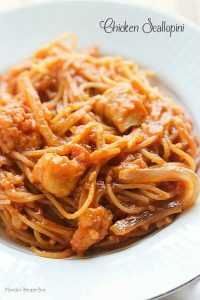 Whenever I’m craving takeout I make this! After the one comment, I hesitate, but what is a fried rice packet? Never heard of it. Looks yummy and instructions look great! No i’m so glad you asked! A fried rice packet is a seasoning packet for fried rice just like you could buy a packet for spaghetti, pesto, etc. I usually find my fried rice packets on the Asian aisle and they are yellow around the edges! Let me know if you can’t find it and I will try to post a picture. Good luck! We grew up with my mom making Fried Rice all the time! So yummy! Thanks for sharing – I’m totally putting this one my menu for next week!